Jumbo Playing Cards – Red and Blue Decks Available! Size: 4 1/2" X 6 7/8"
These Big Box Jumbo Bicycle Playing Cards are like regular Bicycle cards, except they are about twice the width and height. At 4-1/2" x 6-7/8", Big Box Bicycle Decks offer a fun, super-sized alternative to normal cards. The decks are great for magicians, people of all ages, promotions, decorating, and much more. 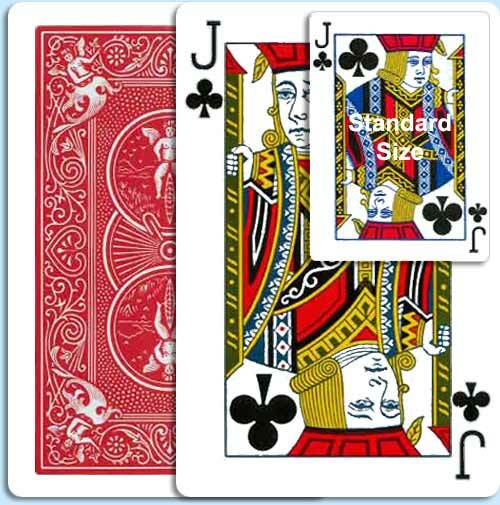 Big Box Bicycle Playing Cards are available with red or blue backs and standard, Bicycle design card faces that run Ace through King with two jokers.